How do I refill the ink tanks? Make sure you have new ink bottles handy and have read the ink safety precautions before you begin. You can continue to use the product even if one or more ink tanks are not filled all the way. However, for the most accurate ink level monitoring, fill all the ink tanks up to the top line. 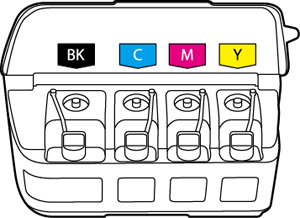 For optimum printing results, refill the ink tanks to the upper line at least once a year. Wear disposable gloves while refilling the ink tanks to avoid staining your hands. If ink spills, wipe it off immediately with a damp towel to avoid permanent stains. If ink gets on your clothes or belongings, it may not come off. Place a sheet of paper or plastic under the ink tank unit, as ink may splatter. If you see a message on the LCD screen telling you to reset the ink levels, note the ink tanks that need refilling and press the OK button. Otherwise, select Setup > Maintenance > Reset Ink Levels and press the Start Color button. 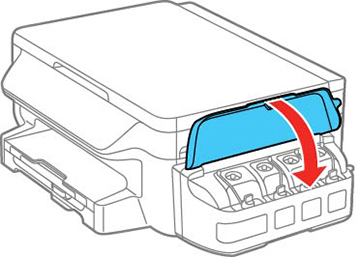 Open the ink tank unit cover, then remove the ink tank cap and place it in the holder shown here. Note: Make sure the color of the ink tank label matches the ink color you want to refill, and only remove the cap from that ink tank. Be careful not to spill any ink. Snap off the tip of the bottle cap, but do not dispose of it so you can use it to seal the bottle cap later, if necessary. Then remove the bottle cap and carefully remove the protective seal (avoid touching the ink underneath the seal). Close the bottle cap tightly. Close the bottle cap tightly; otherwise, ink may leak. Warning: If ink gets on your skin, wash it thoroughly with soap and water. If ink gets into your eyes, flush them immediately with water. If ink gets into your mouth, spit it out immediately. Seek medical advice if problems persist. Keep the ink bottles out of the reach of children and do not drink the ink. Refill the ink tank with the correct color ink up to the upper line on the ink tank. 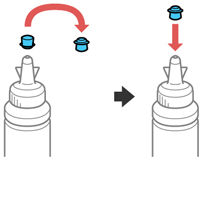 If any ink remains in the ink bottle after filling the ink tank, place the bottle cap tip securely on the bottle cap and store the ink bottle upright for later use. Replace the ink tank cap securely. Repeat the previous steps as necessary for each ink tank you need to refill. Close the ink tank unit cover. Press the left or right arrow buttons to highlight the ink tank you refilled and press the OK button to select it. Repeat for each ink tank color you refilled. Press the Start Color button when you are done to reset the ink levels. Note: The product has a low ink alert system. The accuracy of this system depends on the user refilling the ink tanks correctly. The product cannot directly measure the ink levels in the tanks; instead it estimates the amount of ink remaining by internally monitoring ink usage. The low ink alert system may generate inaccurate messages if the ink tanks are not refilled according to these instructions. Visually check the ink levels in the product’s ink tanks to confirm the actual ink levels. Continued use of the product when the ink is expended could damage the product. Published: Aug 2, 2016 Was this helpful​? Thank you for the feedback!